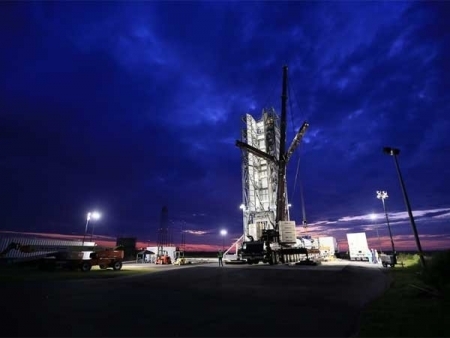 A NASA moon mission gets underway with a rocket launch tonight that should be viewable from the Philadelphia area, New Jersey, and Delaware. In fact much of the East Coast will get to see it blast off from the coast of Virginia. NASA says the Lunar Atmosphere and Dust Environment Explorer, a robotic mission known as LADEE, is set to take off from Wallops Island, Va., at 11:27 p.m. tonight. It will be visible low on the horizon after about :60 seconds after launch in Philadelphia. Orbital Sciences has provided a map outlining the predicted times areas should a get a view. It will look like a bright star or airplane moving in a low eastern arc across the south-southeastern sky. You have to pay attention! The whole trip into space will only last a minute or two. Take a look at Oribital Sciences renderings to get an idea of what the rocket flight path might look like in the sky near you! Philadelphia will have mostly clear skies tonight for optimum viewing. The best place to view the launch in the Philadelphia area would be anywhere in an open space, with a good view of the south-southeast horizon. You can also watch the launch on NASA uStream channel. We are providing the video here. The LADEE is using an unmanned Force Minotaur V rocket. It will orbit the moon and examine the lunar atmosphere on a 160 day mission. 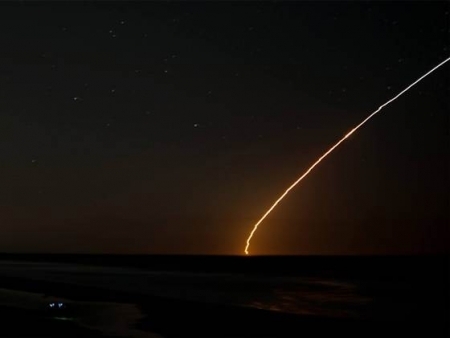 View of launch from Corolla Beach, N.C.